This time I'll show you in pictures what I have laying about waiting for a decent amoung of attention. 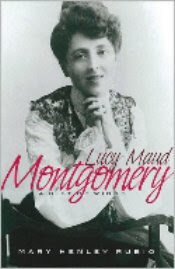 Lucy Maud Montgomery: The Gift of Wings . I mentioned last week how my husband gifted me with this book (which has been on my wish list for awhile -- well....since it came out). I'm excited to get to it this month! Hollywood Worldviews: Watching Films With Wisdom and Discernment . This book looks terribly fascinating. 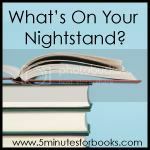 I actually have a few books on my nightstand that relate to engaging (or not) with the culture. Definitely thought provoking books. I guess you can say that I've been conducting a mini personal study on the subject and I'll be sharing more about that soon. Pink Brain, Blue Brain: How Small Differences Grow Into Troublesome Gaps -- And What We Can Do About It . This book just piqued my interest and I'm looking forward to finding out what the author's premise and arguments are in relation to the differences between males and females. 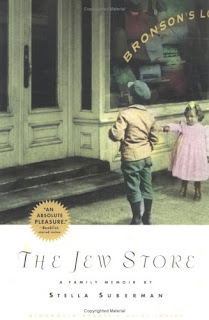 The Jew Store . I've started reading this (it's been on my nightstand for awhile) and it IS very interesting. I just need to pick it back up and get going again. I do have lots of fun reads this month. I'm excited about my stacks. These are the books at the top that should be comin' down the bloggy pipe here shortly as they've been nagging at me recently. You are funny -- time is indeed marching on, although I have to say that from last month's Nightstand to this month's seemed to be a long time for me! I think it's because I had an odd July, on the road for so long. The LM Montgomery book looks interesting. :) I'll have to remember to check back with you in January if you are doing the challenge again for the series. An eclectic group there! I will probably want to read the L. M. Montgomery book at some point. All of them look interesting. I read Hollywood Worldviews in school, and it IS terribly fascinating. I don't agree with everything Godawa says about how culture reflects God, but he makes some pretty awesome points and connections. I think you'll find it intriguing and hooking. :) Enjoy it! You have quite a variety this month! The L.M. Montgomery and the Hollywood book both look interesting. Yes, July has certainly flown by. I start back to school on Monday and I am dreading how my pleasure reading time will be whisked away by school work. I am very interested in hearing about Blue Brain, Pink Brain. I see so many learning differences not only in my students, but in my own son and daughter. Might have to pick this one up. A great list--every single one looks good to me! The Jew store looks terrific. I have been reading the Psalms for comfort and Dorothy Sayers for distraction. Time is spiraling away. It is hard for me to believe that in a few short weeks the children will be going back to school. This summer has felt very odd with our cool weather. You have a variety of reads. Hollywood Worldviews sounds interesting. I will be interested to read what you have to say about the book. All of your books look very interesting....just what I need to do..add more books to my mountain. Very excited to hear your thoughts on the LMM book ... I've been more interested in her since your LMM reading challenge in Jan. and reading your posts about her life. How nice that your husband bought you that book!! Hollywood Worldviews sounds interesting and just the title of The Jew Store intrigues me.